In conducting 360 assessments with our clients, Abudi Consulting Group often hears from staff that they do not have an understanding of strategy for the organization and/or strategy of their own departments. Strategy conversations do not seem to trickle down from executives to their staff. Or, if they are trickling down to the next level of leadership, they aren’t moving much further down from there. Often leaders don’t think that employees care. But they do! They are interested in learning more about the organization overall and strategy is a key component of the organization. This oversight is easily corrected and the benefits to ensuring that strategic is shared are numerous and well worth the extra time to have the conversations. 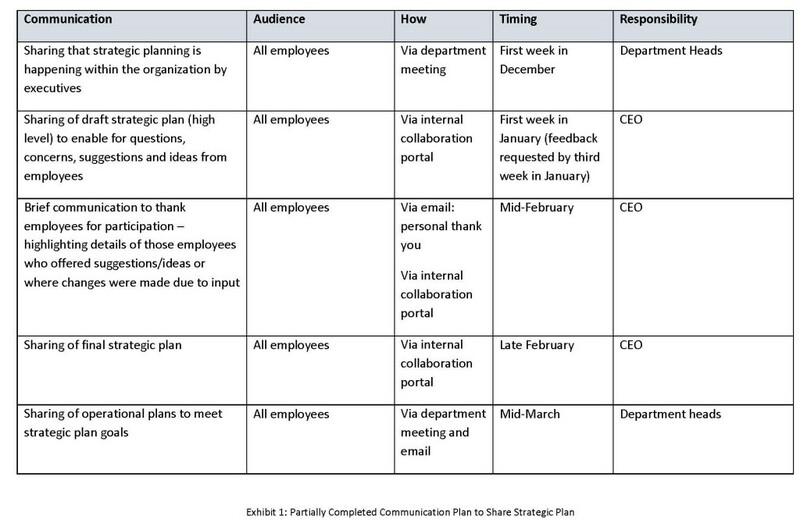 Communicating about strategy does not have to be an onerous process and can be accomplished by developing a strategy for that communication using a variety of methods and channels to get out the message. The executive team must be tasked with ensuring that their next leadership level down is sharing the strategic plan with their direct reports, and so on. Having a communication plan in place as well as regular checking in by executives will ensure this is happening within the organization. It is essential for the CEO and other executives to set expectations about sharing and communicating about the strategic plan. Exhibit 1 is one (partially completed) example that Abudi Consulting Group uses at one of their clients to communicate about a strategy. In Exhibit 1, the client shared that the executive team was going to be off-site for strategic planning and then shared a high level draft of the plan enabling for feedback. For those who shared their thoughts, the CEO sent them a personal “thank you” for their time and their feedback and then also acknowledged their efforts on the collaboration portal. He also highlighted where feedback was incorporated into the final plan. Where feedback was not incorporated, the CEO also explained why it was not. Once finalized, the strategic plan was shared as well as the operational plans. Operational plans were most important to share as this is where the employees in each department would be focused in order to make progress toward the strategic plan. Although not depicted in Exhibit 1, operational plans for each department were maintained in a public location on the collaboration portal so that all employees can access the information and learn about what is happening in every department. Key performance indicators (KPIs) should be developed to measure progress against achieving the plan. Simply having the plans available is not sufficient, ensuring that all projects and assignments are mapped to achieving components of the plan and KPIs are in place to measure progress enables for keeping the strategy “live” within the organization. In order to ensure that every project and major assignment undertaken is aligned to achieving the strategy, each department creates an operational plan that is aligned to the strategic plan. Certainly many initiatives are cross-functional, so operational plans of each department are available for other departments to view. Tactical plans are developed by specific workgroups in each department in order to achieve the operational plan goals. This enables every employee to understand not just the overall strategy but how their particular department and their workgroup within the department is supporting and helping to achieve that strategy.